Has anyone pulled a Disgo (or generic) apart yet? I find the wifi range very short for reliable streaming and I wondered in anyone had taken one apart yet. I have a view to fitting a small "stubby" coax antenna to my radio if I can find a connection point for it. I would probably fit an SMA connector to the outside of the case. If anyone has had one apart I would appreciate a few fotos. Hi, see below. 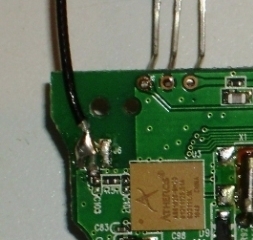 There is a tiny 2 wire cable between the wifi chip and the wifi antenna.